Poutine DOT CO! : Make your own poutine! I've had many American friends tell me that they want to eat a poutine, but the problem is - it's near impossible to find poutine in most of USA, or anywhere really outside of Canada. One way you can easily combat this is by making your own poutine. In United States, it should be fairly easy to find Wisconsin cheese curds. If delicious curds aren't that easy to find, then you can try out the homemade curds recipe we featured a while back here. 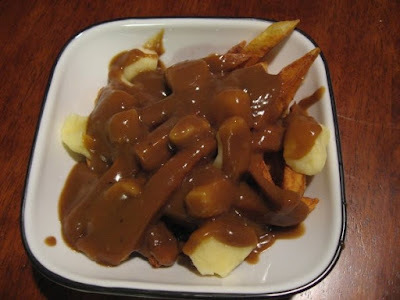 My good friend Melissa from the States made her own poutine (photo above), cut up some Idaho potatoes, used a gravy recipe she really enjoyed and some fresh Wisconsin curds. There are several gravy recipes on the internet that vary depending on your tastes. If you do make your own poutine, let us know how it turns out!